You son of a ditches! xD Anyways, who is Grum? I never even heard of that. Besides all these suspicious characters floating around, I'm super stoked for the horses! Erik 'Grum' Broes is a game developer at Mojang AB. He was originally hired to develop the official modding API and maintain the Minecraft server. Lately they've been hiding his avatar in snapshot photos and such, he's the bugs man lol.. there's even a "bug like easter egg" in the game related to Grum and one for Dinnerbone.. Starting in Minecraft 1.6, any mob named Grumm or Dinnerbone will be rendered upside-down. Aoccdrnig to a rscheearch at Cmabrigde Uinervtisy, it deosn't mttaer in waht oredr the ltteers in a wrod are, the olny iprmoatnt tihng is taht the frist and lsat ltteer be at the rghit pclae. The rset can be a toatl mses and you can sitll raed it wouthit porbelm. Tihs is bcuseae the huamn mnid deos not raed ervey lteter by istlef, but the wrod as a wlohe. 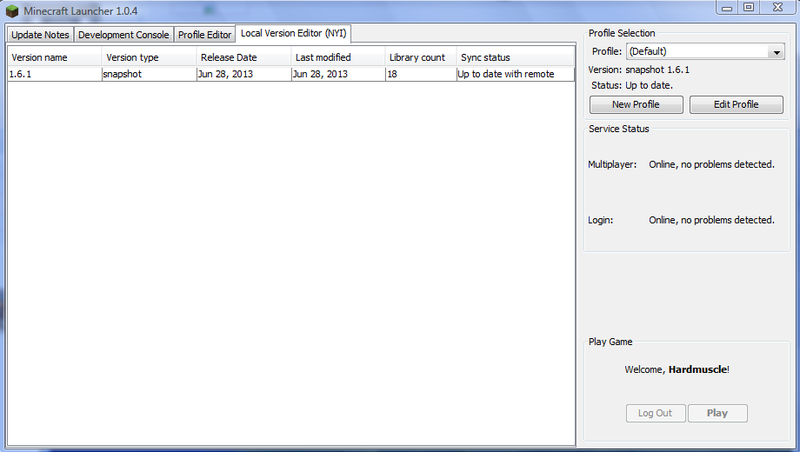 I play cracked minecraft, but it's keep staying at 1.5.2 version. Can anybody help? I don't know how the moderators around here feel about pictures like these but I would hope they at least understand how they are made and where the information they show comes from. The information shown below is custom per viewer meaning that only you see your information, for example the information the images show to me is 'my information' not yours. It should be noted that this type of information can be attained by any website on the internet very easily, because as a user of an ISP, you publish this information the moment you connect to the internet. I share these images to let those who use cracked servers and play cracked clients know how invincible and untouchable they are not and how easy it is to track them into a court. This doesn't even include the tracking that can be done with WireShark..
My prior comments were directed towards those who are openly admitting to theft of the game, not to those who have yet to get the upcoming release on legit clients. Sharing a copy from a friend on the same computer is sharing not stealing but downloading and installing a copy from a 3rd party site and using someone else's credentials and then spoofing the update server for an upgrade is stealing, don't pretend you don't know the difference or what I am referring to. If you don't have a login option on the new launcher check and see if it's set for auto login, it could be using your data from a prior use of it. 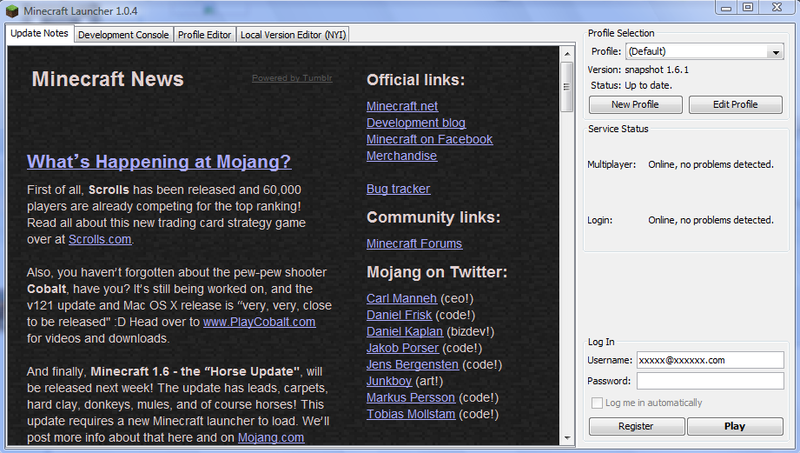 The new launcher for the pre-release (minecraft.dev.exe) directly from mojang has the option to 'Play' whether online or not (as always) and then when I login I have the option to choose a profile, which version or snapshot I'd like to load and go from there. If any of this is different for you, then try "paying" for a license to "legally" participate in the game you love so much, rather than stealing it and complaining because it suddenly got harder to do. I retracted my login information because I feel you should have to pay for it like everyone else. What Mojang should do is track you kids down via your Physical Address (MAC Address) and then send the FBI or CIA to your front door steps, let's see how little you understand about "illegal software pirating" and "copyright fraud" then. The new launcher not only retains your last login info but it will also automatically log you in when you run it, if you leave it set that way and we've pretty much always been able to play the game offline. Oooooooooh...duh! I can't believe I didn't realize that sooner. XD Thanks for the help! HI i tried to upload my minecraft with the new launcher but everytime i try and log in it says "sorry, password or username incorrect, capslock may be on so please try again" and then it has an "okay" button or a "forgot my password" button. I clicked the okay and check everything an rewrote it all but it still dosen't work. I also changed my password but it still didn't work at all! PLEASE HELP !!!! He said that in a bunch of updates. Wheeeeere is the 1.6 .jar? I hate this launcher, I want to use my Magic Launcher, but I can't seem to find the 1.6 .jar. WATCH MY FIRST EVER VIDEO! Don't know why but to make a fresh clean minecraft it takes ages and ages. (15minutes)In the old version it only took about 7 minutes maximum! It took ages to download a fresh 50mb copy? To update a 5mb .jar takes ages? I'm not sure if I should feel sorry for you or if I should feel sorry for your computer. Did anyone notice that there is something behind the fence post? If you did, do you know what it is? Xbox: I don't like Xbox. If you name a mob 'Dinnerbone' or 'Grum' then the mob would flip upside down and stay like that......Weird. Yep. I am really impressed with 1.6. Especially 1.6.2. Wow, this is great! I can't wait. currently it's pretty early in the morning of 1st of july in sweden , so i would expect them to take most of the day to fix bugs before releasing it later in the day.